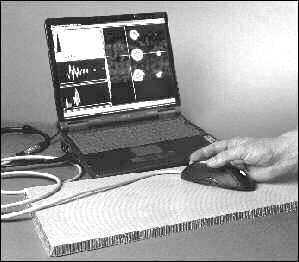 An acoustic Pitch-Catch probe has been mounted in an optical computer mouse and interfaced to a laptop computer. The sensor output is processed using several new algorithms, designed to overcome some of the usual hurdles associated with this technique. This gives a very stable and sensitive result whilst minimising false positive readings. The positional output from the mouse is also used by the software to construct NDT 'C Scan' maps of structures as the mouse is moved over the part. The analysis technique is particularly suitable for any sandwich combination of composites, detecting disbonds, delaminations and core crushing from either side of a panel to mm accuracy. The testing of composites consisting of a honeycomb core sandwiched between skins of various fibre composite mixtures has presented some problems to the use of conventional ultrasonic methods (1). 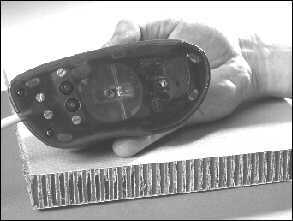 The impedance mismatch between the skin and core and the thickness of many of these constructions attenuates the ultrasound too much for good transmission or reflection results. Thus it has become common to use alternative methods and, in particular, vibrational methods with frequencies less than 100 kHz. A range of probes is commercially available, generically known as 'acoustic probes', which includes the 'Pitch-Catch' probes and 'MIA' probes. These are contact devices, which impart vibration to the structure under test. The probe used for studies reported here is the Pitch-Catch type. Fig 1: Components of a Pitch-Catch probe. Pitch-Catch probes, shown schematically in Figure 1, have two contact tips approximately 10 mm apart. One is used to excite the panel and the other is the detector. Excitation in various commercially available devices is usually a short burst at a particular frequency or a swept sine within the frequency ranges 2 to 70 kHz. Various forms of often quite complex detection and analysis have been used to process the result and produce an output indicative of damage. In general these methods work quite well in that they are sensitive to the defects sought but in fact they are difficult to set up and to calibrate. Whilst this may not be a problem for skilled engineering personnel it is very difficult to set up a system so that relatively unskilled operators can use it to make pass/fail decisions. The probe described in this paper uses the Pitch-Catch principle in its sensor but thereafter the processing, configuration and operation are novel. The sensor is located in a computer "mouse" and, to save confusion, this mouse will be called the Bandicoot to distinguish it from a conventional windows mouse. Figure 2 shows the system layout for the base (simplest) version of the device and Figure 3 is a photograph. The components are the Bandicoot, a mouse, the laptop and the digitisation card. Of these the Bandicoot is the only new part. The laptop requires up to two USB ports and a PS2 port. The USB ports are used by the Bandicoot and the PS2 port can be used for a conventional windows mouse. Fig 2: Components of the Bandicoot. Fig 3: Laptop computer showing the probe connected to an A/D card and a mouse port. The contents of the Bandicoot probe are shown schematically in Figure 4. A typical implementation of the design can also be seen in Figure 5. The Bandicoot contains the dual tipped Pitch-Catch sensors and two optical position detection units as well as several user defined contact switches. Also included within the probe are electronics for exciting the transmit sensor, and impedance matching and filters for the receiving channel. The Pitch-Catch sensors themselves are comprised of strengthened polarised bimorph piezo-ceramic disks that operate in a flexural mode to excite the panel under inspection and detect its response. The ceramic disks are mounted with their edges free and have a characteristic flexural mode frequency of about 30 kHz. The probe tips, contact pins coupling the transducers to the panel, are mounted so that they make a push contact with the centre of each disk. The best material from which to make these tips depends on the intended use. Fig 4: Schematic diagram of a base plan and profile of the probe. The optical position detection units use light emitting diodes to illuminate a small area of surface. This is imaged by a receiver in the same unit. The two dimensional cross correlation between successive images is calculated giving x and y distances for any movement. The output is transmitted to the laptop via a USB port. However, the x and y values detected this way are in the coordinate system of the unit so that any rotation of the probe causes errors from the coordinate system of the user. This is handled by using two optical position units and the correction into the user coordinate system can be calculated knowing the distance between them. Currently this correction is performed in the software on the laptop so two USB ports are required. The example in Figure 5 has a single optical detector. Fig 5: Base of the Probe. Failure to keep the probe level. Off normal orientation of a probe can alter the input significantly. Incorrect pressure against the test piece. Pressure influences the response of the probe and also loads the defect. Failure to keep both tips on the test piece. These points do not sound difficult but it takes a skilled hand to slide a typical probe around whilst maintaining these constraints. If this is not mastered the display can appear to vary wildly. The base of the Bandicoot has 4 soft pads on which it is slid. These are distributed outside the area of the Pitch-Catch NDT sensors and the optical detectors so that the entire unit is held level with the test piece. Four pads are the minimum required to guarantee that accidental tilt is not caused by inadvertent tilting of the hand. This ensures constant tip pressure and tip orientation normal to the surface as well as keeping the load on the panel as far from the test area as possible. Clearly there is a compromise here between base area and stability. Micro switches are also set into the base of the probe to detect lift-off. This is necessary because if the probe is lifted off the panel the reference coordinate system is lost. A number of strategies are incorporated into the software to handle this contingency. The contact detection sensors are situated at the edge of the base in order to allow maximum sensitive to lift-off. Selection of the wrong mode (eg. impulse, swept, other). Selection of the wrong frequency or frequency range. Selection of the optimal display mode. Data from the returned signal can often be displayed in a number of ways. Only some of these parameters will be controlled by the user and their uses are dealt with in the instructions accompanying a system. Even so experience is required to implement them to the best advantage. Instead of discussing the wide variety of ways in which damage is detected and indicated in commercially available instruments, we will only outline the strategy in the Bandicoot. The Bandicoot system does not use any of the conventional excitation signals. Generally the excitation is quite broadband. In fact versions have been built where the excitation is a step function. However, the optimum excitation is a burst of only two or three cycles of a sine wave. This choice is a compromise because there are arguments for both narrow and broad band methods. A narrow band excitation gives a better detection in principle because most defects in sandwich panels have natural frequencies, determined by their size and type. In the past the reasoning behind the use of Pitch-Catch probes has been based on the idea that propagating Lamb waves are excited in the panel and detected as they pass the receive tip. Where there is a defect, the mechanical impedance of the panel is changed yielding both a delay, ie a phase shift, and an amplitude change between 'good' and 'defective' regions. However, we have found that a 'lumped element' model of a defect is often more useful. The propagation velocity of flexural waves in sandwich panels is generally in the range 400 to 600 m.s-1 and is non-dispersive (3). Over much of the frequency range used for these probes this gives wavelengths larger than the defects, making propagation models problematic on account of the small ratio of defect size to wavelength and the small tip separation. If more energy is input at or around that frequency then there is a much better probability of detection and a more accurate estimate of defect boundaries. Where this frequency is known this is obviously a better choice. In fact it is not as difficult as has been traditionally thought to estimate this frequency to within a kHz or so, in some cases, on the basis of other known data (2). On the other hand, if the defect frequency is not known a broadband excitation is better. The main problem in using broad band excitation is that unwanted resonances are also excited which often have a higher Q than the defect response. These may come from the probe or from the test structure. All commercial probes have this problem. If this response falls at or near the defect frequency the functioning of the probe is seriously compromised. If it is sufficiently distant in frequency, band pass filtering will solve the problem but the filter needs to be very high Q itself to attenuate these resonances without attenuating the desirable part of the response. 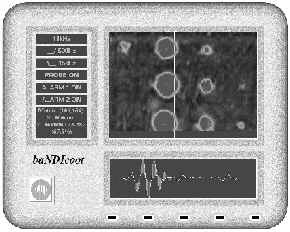 On board the probe, the received waveform is passed through a low pass filter for anti-aliasing and a high pass filter to reduce mechanical, sliding and handling noise. Then it is digitised with a PCMCIA data acquisition card in the laptop. The card in use currently has a maximum sample rate of 300 kHz and a 14-bit A/D converter. The system is configured by the user in a set-up window, in which the digitised, windowed waveform and the FFT are displayed with the probe in a free running mode. Sampling rate, sample size, trigger delay and windowing function are all selectable but defaults are also included. In this window the user can nominate a result to be the reference result or one may be retrieved from memory. The spectrum thus obtained is used for the defect detection. The time waveform is not used for the analysis because it is much less robust to handling noise or other interfering signals. The spectrum usually contains data up to 50 kHz that appears quite complex and without further processing will not give a good result. It is necessary for the user to decide which parts of the spectrum are useful and which parts are artefacts of the equipment and test piece dimensions. On the basis of this knowledge a band of the spectrum can be selected for further analysis. In other words, the data is digitally filtered. The selection can be made by viewing the spectrum collected over a 'good' piece of panel. This reveals the frequency structure not introduced by the defect. Unfortunately over the defect the spectrum will generally be altered across the whole frequency range. Knowledge of the likeliest frequency band for defect response would allow a range to be chosen where the effects of the defect are maximised compared to other structures. A small number of 'built-in' ranges are available for some popular sandwich constructions. Once the set up is complete the user transfers to a scan window that contains a display graticule and a data window, shown in Figure 6. As mentioned above, the analysis is done in the frequency domain. A band of frequencies may have been selected, either by the user during set up or as the default or the complete spectrum can be used. The frequency data is compared to the reference data and a 'damage index' calculated. This number is used to create a colour display of the scan area in the display graticule. Fig 6: Instrument display during scan review. At this stage the system activates the probe. Control over the cursor is switched back and forth between the windows mouse and the Bandicoot, driven by particular mouse (or Bandicoot) events. For instance if the Bandicoot detects movement it gets the cursor and places it in the display window at the coordinates where it was last active. If the mouse detects an appropriate event it takes the cursor and the user can then operate the windows mouse for on-screen selections as usual. With two user defined buttons, the Bandicoot can be configured to take single samples at the click of a button, take continuous samples to "colour" an area of suspect panel or to place one of 10 location flags. With the dedicated lift-off contact switches, the probe can also respond to situations where it is lifted and replaced elsewhere on a panel without the risk of overwriting data already obtained. For each sample taken, the recorded waveform is displayed on the computer screen along with its calculated index value, and saved to disk in its entirety to permit future analysis. Once a scan has been completed the data can be retrieved and the display recreated. Because the original waveforms have been stored, the software also allows the user to re-analyse them, using a different frequency band, or re-display the data using different colour options as well as zoom. Areas and traverses of the image may be selected for dimensional measurements and a "B Scan" option is also available. In this mode the waveforms are displayed continuously in the data window as the mouse is moved over the display graticule. The Bandicoot is a novel implementation of the acoustic Pitch-Catch probe technique. It uses new analysis algorithms designed to maximise reliability and increase sensitivity at the same time. The probe is housed in a computer mouse-like structure, which improves the reliability and reproducibility of the results. The mouse interfaces with a PC in the conventional manner so the 'C Scans' can be created on the display as the data is collected. Apart from the mouse, the only other hardware requirements are the laptop and an A/D card. R.D. Adams and P. Cawley, 'A review of defect types and nondestructive testing techniques for composites and bonded joints' NDT International Vol 21, No 4, p208-222, 1988. L.P. Dickinson and S. Thwaites, 'Characteristics of soft impact damage in composite sandwich panels using a Pitch-Catch acoustic probe' Acoustics Australia, Vol 27, No 2, p37-40, 1999. S. Thwaites and N.H. Clark, 'Non-destructive testing of honeycomb sandwich structures using elastic waves.' Journal of Sound and Vibration 187, p253-269, 1995.